Being anticipatory can mean many things. In some cases, it’s about identifying opportunities for major disruptions that you yourself can introduce (think Uber, Kickstarter and other ideas that set entire industries on their ear.) 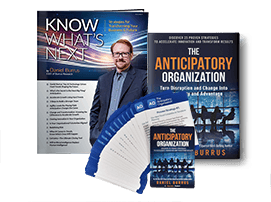 But being anticipatory also means being aware of disruption from others that may impact you—and knowing how to prepare accordingly. To that end, let’s consider the relationship between two important forces: digital disruption and the people in your organization. Recent research by Accenture Strategy found that 82 percent of business leaders anticipate that their organizations will be digital businesses within the next three years. On one hand, leaders see that as a decidedly positive trend, boosting productivity, innovation and other workplace attributes. On the other hand, there is a perceived disconnect as well. Acknowledging the expected benefits of being digital is by no means the same thing as being digital. More importantly, simply expecting something to happen doesn’t adequately prepare your workforce to use new digital tools to successfully drive innovation and uncover new opportunities. According to the Accenture report, those things begin at the top. Strong leadership should encourage a positive, constructive future outlook (a cornerstone of my Anticipatory Organization Model, called Futureview) and actively support that through collaborative technologies and widespread employee engagement and education. The Accenture study identified a number of positive aspects for increased use of digital applications. Employees are excited about the possible advancements from greater use of digital technology, particularly innovation. Even more traditional attributes such as agility were cited as benefitting from greater use of digital tools. By a wide margin (82 percent), employees said they expected digital technology to transform the way they work over the next several years; forty-four percent said they anticipated that level of change to be significant. But it’s interesting to observe that employee attitudes toward digital disruption often go beyond mere anticipation. In effect, employees expect their organizations and leadership to commit to adapting and embracing the different work environment that digital technology can introduce. That’s particularly the case with younger employees and millennials. The reasons are compelling. For one thing, younger employees are much more digitally savvy than prior workforces. Not only are they inherently more comfortable with digital technology, they are taking it upon themselves to prepare for digital change. According to the Accenture study, more than 70 percent of employees said they are proactively learning new digital tools and skills to better adapt to digital change. But, in their eyes, it shouldn’t be a solely solitary effort. They will also expect access to the best digital tools to enable them to do their job. They will also look askance at any organization that fails to recognize the value of sufficiently adopting and investing in digital systems. These and other factors are also contributing to a very different mind-set regarding the workplace, one that leaders need to anticipate and prepare for. As many commentators have pointed out, younger employees often value their working environment as much as their salary. Moreover, younger employees see a less distinct separation between their personal and professional lives. Given the connectivity of the internet and other tools, they’re used to being in touch and available. They’re a generation who’s comfortable with indistinct lines between home and work. To me, this comes down to a different expectation of leadership. Since technology can make work more independent and flexible by nature, younger employees expect a new level of autonomy and freedom from their leaders. They value control of where and when they work and a reasonable amount of freedom in what they do. In my consultations with organizations of all sorts, it’s evident that digital disruption is driving pervasive change. What are you doing to anticipate those changes and prepare accordingly?